Red Moon is a difficult novel to review. Set in a future which is as close to what you might think the future should be. There are no impossible flying cars or teleportation devices. Instead there is private space flight, small colonies on the moon and quantum-entanglement based secure communication. 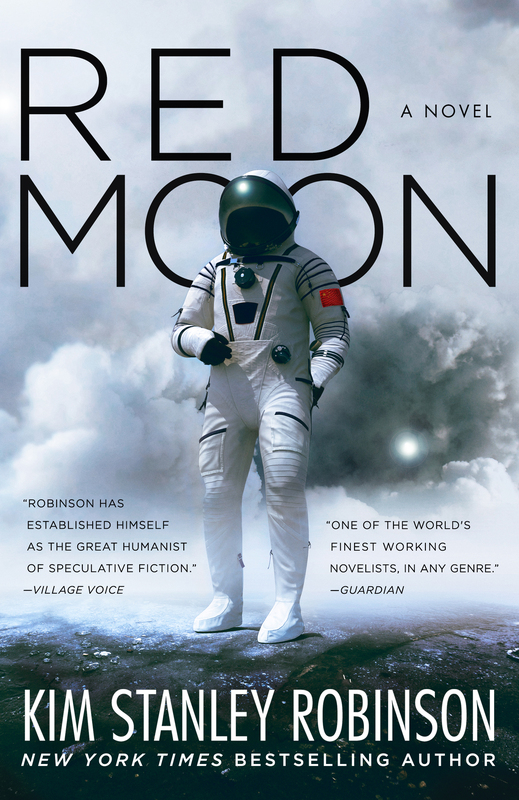 Red Moon is set in a world in which China has continue to grow into the super power it is obvious it will become. It essentially exists in steady partnership with the US, never really friends but with economic ties that can’t be broken. The author Kim Stanley Robinson takes the reader through a story in which the Chinese outlook on life. And how it can cause factionalism, conflict and uncertainty besides focusing on common goals. In many ways it is a deep dive into the social and political landscape of the country with the largest population (soon to be overtaken by India). Many historical figures are mentioned: Mao, Zhou Enlai, Deng Xiaoping as well as the current leader Xi Jinping. All this to establish a backdrop for a story that starts as a simple murder on the moon. In fact, the story starts so mundane I was somewhat underwhelmed throughout the first 100 pages. And yet it is unfair to call the novel a slow-burn. So what is Red Moon all about? Fred Fredericks, an American working for a Swiss company, delivers a quantum-entangled communication device to a customer on the moon. The device allows for secure communication with its twin. As China is gearing up for a change of leadership somebody wants to prevent their communications from being intercepted. The recipient of the device, Chang Yazu, governor of the Chinese colony, dies of poisoning as soon as Fred shakes his hand. Presumably Chang is the victim of the infighting in China and Fred is blamed. Afterwards no official investigation is performed as due to the fractured nature of Chinese politics and policing it is too much of a hot-potato. Meanwhile aging poet and travel vlogger Ta Shu becomes worried when he no longer hears from Fred. Ta Shu became acquainted with Fred while landing at the base and considers the young man a friend. While navigating the quagmire of Chinese politics in search for answers Ta Shu is well able to give the reader an overview of how the country is run, how its people think and what the importance is of Feng Shui in their daily lives. The third and final principal character of Red Moon is Chan Qi. She is the daughter of the Minister of Finance and thus considered a princeling. Her rebellious nature seems confusing to the reader at first as she appears to have nothing to do with the murder Fred is accused of. Instead she is pregnant, unauthorized, while on the moon, and together with Fred is sent back to Earth. Quickly the reader feels that there is more about Chan than meets the eye. Chan is a classic freedom fighter, willing to commit to the cause while facing insurmountable odds. Chan cares deeply for the working poor of China. Those that have been forced to leave their homes in the countryside for work in the city but cannot use any of its services because they are not registered. Again Chan provides the reader with more of the backdrop. As Fred and Chan try to stay out of the clutches of whatever faction is hunting them down the reader is brought along for a very detailed ride of locations such as Beijing, Hong Kong and Shekou. Kim Stanley Robinson is famous for his hard-sf novels. And though there are no equations that I can discover talks of politics, quantum theory, Artificial Intelligence, the afore-mentioned Feng Shui and much else certainly makes it feel like a Kim Stanley Robinson novel. By page 200 Red Moon becomes a true page turner. The rather mundane murder that starts the story off has made way for suspense wherein personal character traits decide the overarching flow of the story. I cannot help but take some aspects of Red Moon personally. A lot of the descriptions of science and localities coincide with my own interests. China has always been a bit of a magical black box. You do not know how it works or what is inside it but the reality it creates is nothing short of astounding. Kim Stanley Robinson manages to make use of that magic. The character of Fred Fredericks feels like an autobiographical view of the author itself. A young man thrown into an adventure outside of his control, but at least he is coping. I also recognize a lot of elements from that young man inside of me, and that makes Red Moon one of the best novels I have read this year. Previous story Exapunks Review – learn to program while gaming!